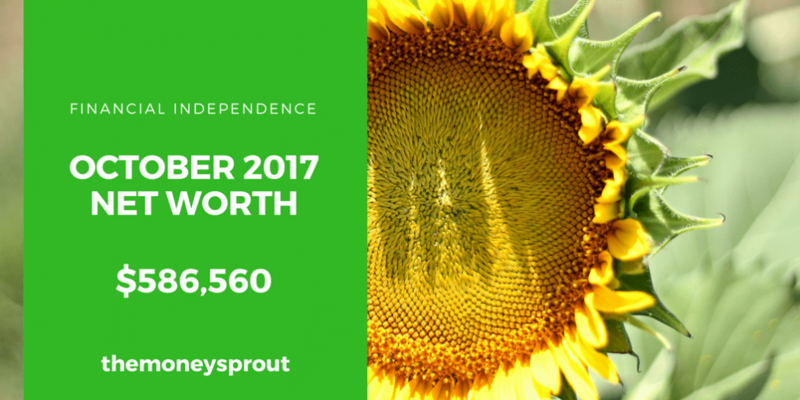 It has been 2 years, 7 months since we started tracking our net worth and posting our updates here on The Money Sprout. In that time, there has only been one instance that our net worth has dropped. So it should be no surprise that in October … we are reporting another large increase (compared to September). With this latest increase, we continued our streak of positive increases to our net worth every single month in 2017. For the 10th consecutive month (starting in January of this year) … we have grown our net worth. Since that first report back in March 2015, we have grown our net worth by 34.8%! That is an increase of over $151,000+ in just 2.5+ years. It is an awesome feeling knowing we are growing our net worth by thousands and thousands of dollars every single year! As of October 19th, 2017 – our net worth is $586,559.78! Here is our most recent update, compared to our last net worth post in September. Our net worth in October 2017 increased by a good 1.50% compared to September (2017). That is an increase of over $8,500 in 1 month. That is the way I like it … steady and growing each and every month! Once again, this past month saw another big increase in the stock market. I am anxiously waiting for the bottom to fall out with a big correction … so that we can pounce and invest more dollars! I want to buy awesome dividend stocks on sale at a big discount rather than paying retail or higher right now. The value of our investments increased by 1.26%. We saw a drop of over $1,000 in our cash balance compared to last month. Was it from investing a lot more money into the stock market? Not exactly … I accidentally paid my mortgage twice last month! Good thing we had the cash to cover it. How exactly did I pay my mortgage twice you may ask? Well we setup a new checking account (to earn that $300 to put into our IRA) last month. And I setup an automated deduction on the 6th of every month to pay our mortgage. But I also forgot that I had already paid it for October. So … in the end … it is another learning lesson to make sure you know all your automated investments or transfers between accounts. Just a slight uptick in home value from last month. Just like when it dropped $500+ the month prior … no big deal. Overall, 2 out of 3 of our major asset classes saw increases. Investments (as usual) really helped to push our net worth higher this past month. The only declining asset was cash and was due to a mistake on my part. The good news is that it went to pay down some debt … so the money is not wasted. Total assets rose by 0.65% since last reporting. We continued that trend in October by rounding off our payment and putting a few extra dollars towards our principal. Not a huge difference, but if feels good to pay down that debt! Then we had our second normal payment go through with an automated deduction for the regular mortgage amount. That dropped our cash balance by a decent amount … but the good news is we can skip November’s payment now. Note – We haven’t paid on loan #2 amount yet for October, based on when we publish this report. And we have technically paid 2 installments of loan #1 since last reporting. And I recently highlighted how we are having a difficult time hitting our minimum spend for the first card we opened. This is because we are trying to slash our monthly budget … and it seems to be working. Since last reporting, our mortgage balance has dropped – as expected … by a bunch because of my double payment. It is good to know that each payment we make, we are paying less and less interest. Because of amortization, each payment we make … the principal drops at a higher and higher rate. We also saw a great big drop in our car loan debt and an even bigger drop in our credit card spending. Collectively our total liabilities dropped by over $3,400+ … which is awesome! I believe that is the biggest drop we have ever seen in a month from our liabilities. As I like to point out every time we talk about net worth … there are 2 sides to the equation. So a decrease in liabilities by ~$3,400+ is just as important as increasing our assets by the same amount. After reviewing our net worth number for this October, most of our gains came from our investments … but a lot came from lowering our liabilities too. Besides increasing our investments, we were able to lower our liabilities by over $3,000+, which helps just as much as increasing our assets by the same amount. Part of that was paying our mortgage twice … but it still helps build our net worth. In addition to lowering our debt, we were able to spend a lot less … which helped lower our credit card balances.